Easy 3 points on paper given we have only lost once against these guys in the last 12 years (20 matches). Lets hope so, i remember some tough games away in Berlin.. But then again, Berlin is not Berlin anymore and they lost Ramos. what if we meet hertha at home in the pokal next round? I've written before about fluid formations, and I still believe it is central to Pep's current tactics, but I think we can expect only 3 defenders anytime Bayern play a team from outside the top 4-5 in the Bundesliga (except Dortmund). So I'd reckon on 3 defenders tomorrow, with 2 of Alonso, Schweinsteiger and Rode playing in front of them and the 3rd being subbed in, to give Schweinsteiger and Rode more playing time. I'd love to see Rode and Hojbjerg get some time, but I wouldn't be surprised to see a front five of Lewa, Ribery, Götze, Müller, and Robben again. I think Ribery and Alonso need some rest, and we should be careful with Schweini. For sure Götze and Müller will start. Alonso might rest this one. I hope Schweinstiger can be ready for a full or at least 65 minutes. Since Rafinha is mostly in midfield against Hoffenheim, he was barely an RB in that game so Rode could play there instead. 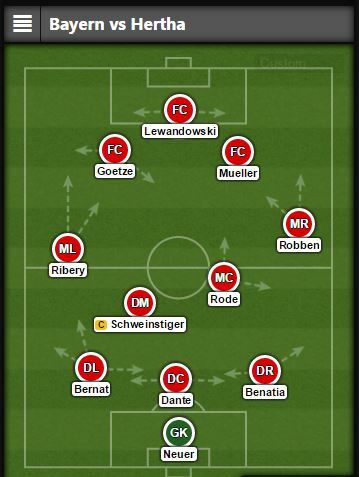 Benatia or Boateng to cover the CB/RB spot. Btw i've read that Ribs needs a break? What for, he just came back from injury and should be @ atleast 95% left in the tank. Every time there's a game there I remember Kraft walking out of the pitch faking an injury at half time first time he faced Bayern again. Beats the hell out the 'rock, paper & scissors" scene every day of the week. runaway wrote: Alonso might rest this one. I hope Schweinstiger can be ready for a full or at least 65 minutes. Since Rafinha is mostly in midfield against Hoffenheim, he was barely an RB in that game so Rode could play there instead. Benatia or Boateng to cover the CB/RB spot. Lol at Muller having no directions where to be at on the pitch. Pep just tells him "Do whatever u want"